Maternal health is the health of women during pregnancy, childbirth, and the postpartum period. It encompasses the health care dimensions of family planning, preconception, prenatal, and postnatal care in order to ensure a positive and fulfilling experience in most cases and reduce maternal morbidity and mortality in other cases. The United Nations Population Fund (UNFPA) estimated that 289,000 women died of pregnancy or childbirth related causes in 2013. These causes range from severe bleeding to obstructed labour, all of which have highly effective interventions. As women have gained access to family planning and skilled birth attendance with backup emergency obstetric care, the global maternal mortality ratio has fallen from 380 maternal deaths per 100,000 live births in 1990 to 210 deals per 100,000 live births in 2013. This has resulted in many countries halving their maternal death rates. While there has been a decline in worldwide mortality rates much more has to be done. High rates still exist particularly in impoverished communities with over 85% living in Africa and Southern Asia. The effect of a mother's death results in vulnerable families, and their infants, if they survive childbirth, are more likely to die before reaching their second birthday. Both maternal mortality (death) and severe maternal morbidity (illness) are "associated with a high rate of preventability." In 2010 the U.S. Joint Commission on Accreditation of Healthcare Organizations described maternal mortality as a "sentinel event", and uses it to assess the quality of a health care system. Four elements are essential to maternal death prevention. First, prenatal care. It is recommended that expectant mothers receive at least four antenatal visits to check and monitor the health of mother and foetus. Second, skilled birth attendance with emergency backup such as doctors, nurses and midwives who have the skills to manage normal deliveries and recognize the onset of complications. Third, emergency obstetric care to address the major causes of maternal death which are haemorrhage, sepsis, unsafe abortion, hypertensive disorders and obstructed labour. Lastly, postnatal care which is the six weeks following delivery. During this time bleeding, sepsis and hypertensive disorders can occur and newborns are extremely vulnerable in the immediate aftermath of birth. Therefore, follow-up visits by a health worker is assess the health of both mother and child in the postnatal period is strongly recommended. According to a UNFPA report, social and economic status, culture norms and values, and geographic remoteness all increase a maternal mortality, and the risk for maternal death (during pregnancy or childbirth) in sub-Saharan Africa is 175 times higher than in developed countries, and risk for pregnancy-related illnesses and negative consequences after birth is even higher. In developed countries, Black (non-Latina) women have higher maternal mortality rates than White (non-Latina) women. According to the New York City Department of Health and Mental Hygiene - Bureau of Maternal, Infant and Reproductive Health, it was found that from 2008 to 2012, Black (non-Latina) women have a pregnancy-related mortality rate twelve times higher than White (non-Latina) women. Poverty, maternal health, and outcomes for the child are all interconnected. Women living in poverty-stricken areas are more likely to be obese and engage in unhealthy behaviors such as cigarette smoking and drug use, are less likely to engage in or even have access to legitimate prenatal care, and are at a significantly higher risk for adverse outcomes for both the mother and child. A study conducted in Kenya observed that common maternal health problems in poverty-stricken areas include hemorrhaging, anemia, hypertension, malaria, placenta retention, premature labor, prolonged/complicated labor, and pre-eclampsia. Generally, adequate prenatal care encompasses medical care and educational, social, and nutritional services during pregnancy. Although there are a variety of reasons women choose not to engage in proper prenatal care, 71% of low-income women in a US national study had difficulties getting access to prenatal care when they sought it out. Additionally, immigrants and Hispanic women are at higher risk than white or black women for receiving little to no prenatal care, where level of education is also an indicator (since education and race are correlated). Adolescents are least likely to receive any prenatal care at all. Throughout several studies, women and adolescents ranked inadequate finances and lack of transportation as the most common barriers to receiving proper prenatal care. Income is strongly correlated with quality of prenatal care. Sometimes, proximity to healthcare facilities and access to transportation have significant effects on whether or not women have access to prenatal care. An analysis conducted on maternal healthcare services in Mali found that women who lived in rural areas, far away from healthcare facilities were less likely to receive prenatal care than those who lived in urban areas. Furthermore, researchers found an even stronger relationship between lack of transportation and prenatal and delivery care. In addition to proximity being a predictor of prenatal care access, Materia and colleagues found similar results for proximity and antenatal care in rural Ethiopia. Maternal HIV rates vary around the world, ranging from 1% to 40%, with African and Asian countries having the highest rates. Whilst maternal HIV infection largely has health implications for the child, especially in countries where poverty is high and education levels are low, having HIV/AIDS while pregnant can also cause heightened health risks for the mother. A large concern for HIV-positive pregnant women is the risk of contracting tuberculosis (TB) and/or malaria, in developing countries. During pregnancy, women of an average pre-pregnancy weight (BMI 18.5-24.9) should expect to gain between 25-35 pounds over the course of the pregnancy. Increased rates of hypertension, diabetes, respiratory complications, and infections are prevalent in cases of maternal obesity and can have detrimental effects on pregnancy outcomes. Obesity is an extremely strong risk factor for gestational diabetes. Research has found that obese mothers who lose weight (at least 10 pounds or 4.5 kg) in-between pregnancies reduce the risk of gestational diabetes during their next pregnancy, whereas mothers who gain weight actually increase their risk.. Women who are pregnant should aim to exercise for at least 150 minutes per week, including muscle strengthening exercises. Maternal oral health has been shown to affect the well-being of both the expectant mother and her unborn fetus. The 2000 Surgeon's General Report stressed the interdependence of oral health on the overall health and well-being of an individual. Oral health is especially essential during perinatal period and the future development of the child. Proper management of oral health has benefits to both mother and child. Furthermore, lack of understanding or maintenance of good oral health for pregnant women may have adverse effects on them and their children. Hence, it is imperative to educate mothers regarding the significance of oral health. Moreover, collaboration and support among physicians across various fields, especially among family practitioners and obstetricians, is essential in addressing the concerns for maternal oral health. In 2007, the Maternal Oral Health Project was developed to provide routine oral care to low-income pregnant women in Nassau County, NY. Since its inception, the program has treated more than 2,000 pregnant women, many of whom had significant gum and/or tooth problems. Oral health has numerous implications on overall general health and the quality of life of an individual. The Surgeon General's Report lists various systemic diseases and conditions that have oral manifestations. The oral cavity serves as both a site of and a gateway entry of disease for microbial infections, which can affect general health status. In addition, some studies have demonstrated a relationship between periodontal diseases and diabetes, cardiovascular disease, stroke, and adverse pregnancy outcomes. Furthermore, the report establishes a relationship between oral health and quality of life, including functional, psychosocial, and economic indicators. Poor oral health can affect diet, nutrition, sleep, psychological status, social interaction, school, and work. Protection and control of oral health and diseases safeguards a woman's health and quality of life before and during pregnancy. Also, it has the potential to decrease the transmission of pathogenic bacteria that occurs from mother to child. Along with pregnancy, come physiological changes for a woman. The changes, including fluctuating hormones, increase the woman's susceptibility to oral infections such as periodontal disease. This disease impairs the body's ability to repair and maintain soft tissues. It also causes indirect damage through bacterial induction of both inflammatory and immune responses of the host. During pregnancy, mild inflammation of the gums, "pregnancy gingivitis", is quite common and if left untreated can lead to periodontal disease. There have been an increased number of studies establishing associations between, periodontal disease and negative health outcomes, which include tooth loss, cardiovascular disease, stroke, poor diabetes control, and adverse birth outcomes. For example, one such study found that moderate or severe periodontal disease early in pregnancy was associated with delivery of small-for-gestational-age infant. Other studies have also found an association between periodontal disease and development of pre-eclampsia and pre-term births. The significance of oral health is apparent, however, many women do not receive dental services before, during, and after pregnancy, even with obvious signs of oral disease. There are several factors at play regarding pregnant women not seeking dental care, including the role of the health care system and disposition of the woman herself. There is a common misconception that it is not safe to obtain dental services while pregnant. Many prenatal and oral health providers have limited knowledge about the impact and safety of delivering dental services; hence they might delay or withhold treatment during pregnancy. Moreover, some prenatal providers are not aware of the importance of oral health on overall general health, thus failing to refer their patients to dental providers. First and foremost, the misconception regarding the impact of dental services while a woman is pregnant needs to be purged. There is a consensus that prevention, diagnosis, and treatment of oral diseases are highly beneficial and can be performed on pregnant women having no added fetal or maternal risk when compared to the risk of providing no oral care. Equally important is establishing collaboration among clinicians, especially maternal health providers, with other dental providers. There should be coordination among general health and oral health providers, especially because of the interdependence of the two fields. Thus, it is imperative to educate and train health providers of the significance of oral health, designing methods to incorporate in their respective practices. Providers most provide education to pregnant women addressing the importance of oral health, because these women ultimately control the fate of themselves and their offspring. For example, providers can illustrate to mothers how to reduce cavities by wiping down the gums of their children with a soft cloth after breastfeeding or bottle-feeding. Bestowing knowledge and practical applications of good oral health maintenance measures to mothers can help improve overall health of the mother and child. There are still other factors in play when analyzing the low use of dental services by pregnant women, particularly prevalent among ethnic and racial minorities. A major factor is the lack of insurance and or access to dental services. For this reason, more data needs to be collected and analyzed so that programs are set up to effectively to reach all segments of the population. Prenatal care is an important part of basic maternal health care. It is recommended expectant mothers receive at least four antenatal visits, in which a health worker can check for signs of ill health – such as underweight, anaemia or infection – and monitor the health of the foetus. During these visits, women are counseled on nutrition and hygiene to improve their health prior to, and following, delivery. They can also develop a birth plan laying out how to reach care and what to do in case of an emergency. Poverty, malnutrition, and substance abuse may contribute to impaired cognitive, motor, and behavioral problems across childhood. In other words, if a mother is not in optimal health during the prenatal period (the time while she is pregnant) and/or the fetus is exposed to teratogen(s), the child is more likely to experience health or developmental difficulties, or death. The environment in which the mother provides for the embryo/fetus is critical to its wellbeing well after gestation and birth. A teratogen is "any agent that can potentially cause a birth defect or negatively alter cognitive and behavioral outcomes." Dose, genetic susceptibility, and time of exposure are all factors for the extent of the effect of a teratogen on an embryo or fetus. Prescription drugs taken during pregnancy such as streptomycin, tetracycline, some antidepressants, progestin, synthetic estrogen, and Accutane, as well as over-the-counter drugs such as diet pills, can result in teratogenic outcomes for the developing embryo/fetus. Additionally, high dosages of aspirin are known to lead to maternal and fetal bleeding, although low-dose aspirin is usually not harmful. Newborns whose mothers use heroin during the gestational period often exhibit withdrawal symptoms at birth and are more likely to have attention problems and health issues as they grow up. Use of stimulants like methamphetamine and cocaine during pregnancy are linked to a number of problems for the child such as low birth weight and small head circumference and motor and cognitive developmental delays, as well as behavioral problems across childhood. The American Academy of Child and Adolescent Psychiatry found that 6 year-olds whose mothers had smoked during pregnancy scored lower on an intelligence test than children whose mothers had not. Cigarette smoking during pregnancy can have a multitude of detrimental effects on the health and development of the offspring. Common results of smoking during pregnancy include pre-term births, low birth weights, fetal and neonatal deaths, respiratory problems, and sudden infant death syndrome (SIDS), as well as increased risk for cognitive impairment, attention deficit hyperactivity disorder (ADHD) and other behavioral problems. Also, in a study published in the International Journal of Cancer, children whose mothers smoked during pregnancy experienced a 22% risk increase for non-Hodgkin lymphoma. Although alcohol use in careful moderation (one to two servings a few days a week) during pregnancy are not generally known to cause fetal alcohol spectrum disorder (FASD), the US Surgeon General advises against the consumption of alcohol at all during pregnancy. Excessive alcohol use during pregnancy can cause FASD, which commonly consist of physical and cognitive abnormalities in the child such as facial deformities, defective limbs, face, and heart, learning problems, below average intelligence, and intellectual disability (ID). Although HIV/AIDS can be transmitted to offspring at different times, the most common time that mothers pass on the virus is during pregnancy. During the perinatal period, the embryo/fetus can contract the virus through the placenta. Gestational diabetes is directly linked with obesity in offspring through adolescence. Additionally, children whose mothers had diabetes are more likely to develop Type II diabetes. Mothers who have gestational diabetes have a high chance of giving birth to very large infants (10 pounds or more). Because the embryo or fetus's nutrition is based on maternal protein, vitamin, mineral, and total caloric intake, infants born to malnourished mothers are more likely to exhibit malformations. Additionally, maternal stress can affect the fetus both directly and indirectly. When a mother is under stress, physiological changes occur in the body that could harm the developing fetus. Additionally, the mother is more likely to engage in behaviors that could negatively affect the fetus, such as tobacco smoking, drug use, and alcohol abuse. Genital herpes can be passed to the offspring through the birth canal during delivery. In pregnancies where the mother is infected with the virus, 25% of babies delivered through an infected birth canal become brain damaged, and 1/3 die. HIV/AIDS can also be transmitted during childbirth through contact with the mother's body fluids. Mothers in developed countries may often elect to undergo a caesarean section to reduce the risk of transmitting the virus through the birth canal, but this option is not always available in developing countries. Globally, more than eight million of the 136 million women giving birth each year suffer from excessive bleeding after childbirth. This condition—medically referred to as postpartum hemorrhage (PPH)—causes one out of every four maternal deaths that occur annually and accounts for more maternal deaths than any other individual cause. Deaths due to postpartum hemorrhage disproportionately affect women in developing countries. During the postpartum period, many mothers breastfeed their infants. Transmission of HIV/AIDS through breastfeeding is a huge issue in developing countries, namely in African countries. The majority of infants who contract HIV through breast milk do so within the first six weeks of life. However, in healthy mothers, there are many benefits for infants who are breastfed. The World Health Organization recommends that mothers breastfeed their children for the first two years of life, whereas the American Academy of Pediatrics and the American Academy of Family Physicians recommend that mothers do so for at least the first six months, and continue as long as is mutually desired. Infants who are breastfed by healthy mothers (not infected with HIV/AIDS) are less prone to infections such as Haemophilus influenza, Streptococcus pneunoniae, Vibrio cholerae, Escherichia coli, Giardia lamblia, group B streptococci, Staphylococcus epidermidis, rotavirus, respiratory syncytial virus and herpes simplex virus-1, as well as gastrointestinal and lower respiratory tract infections and otitis media. Lower rates of infant mortality are observed in breastfed babies in addition to lower rates of sudden infant death syndrome (SIDS). Decreases in obesity and diseases such as childhood metabolic disease, asthma, atopic dermatitis, Type I diabetes, and childhood cancers are also seen in children who are breastfed. Maternal health problems include complications from childbirth that do not result in death. For every woman that dies during childbirth, approximately 20 suffer from infection, injury, or disability. Around 75% of women who die in childbirth would be alive today if they had access to pregnancy prevention and healthcare interventions. Black women are more likely to experience pregnancy related deaths as well as receiving less effective medical care during pregnancy . Almost 50% of the births in developing countries still take place without a medically skilled attendant to aid the mother, and the ratio is even higher in South Asia. Women in Sub-Saharan Africa mainly rely on traditional birth attendants (TBAs), who have little or no formal health care training. In recognition of their role, some countries and non-governmental organizations are making efforts to train TBAs in maternal health topics, in order to improve the chances for better health outcomes among mothers and babies. Breastfeeding provides women with several long-term benefits. Women who breastfeed experience better glucose levels, lipid metabolism, and blood pressure, and lose pregnancy weight faster than those who do not. Additionally, women who breastfeed experience lower rates of breast cancer, ovarian cancer, and type 2 diabetes. However, it is important to keep in mind that breastfeeding provides substantial benefits to women who are not infected with HIV. In countries where HIV/AIDS rates are high, such as South Africa and Kenya, the virus is a leading cause of maternal mortality, especially in mothers who breastfeed. A complication is that many HIV-infected mothers cannot afford formula, and thus have no way of preventing transmission to the child through breast milk or avoiding health risks for themselves. In cases like this, mothers have no choice but to breastfeed their infants regardless of their knowledge of the harmful effects. Maternal Mortality Rate worldwide, as defined by the number of maternal deaths per 100,000 live births from any cause related to or aggravated by pregnancy or its management, excluding accidental or incidental causes. Worldwide, the Maternal Mortality Ratio (MMR) has decreased, with South-East Asia seeing the most dramatic decrease of 59% and Africa seeing a decline of 27%. There are no regions that are on track to meet the Millennium Development Goal of decreasing maternal mortality by 75% by the year 2015. In a September 2016 ACOG/SMFM consensus, published concurrently in the journal Obstetrics & Gynecology and by the American College of Obstetricians and Gynecologists (ACOG), they noted that while they did not yet have a "single, comprehensive definition of severe maternal morbidity" (SMM), the rate of SMM is increasing in the United States as is maternal mortality. Both are "associated with a high rate of preventability." The U.S. Joint Commission on Accreditation of Healthcare Organizations calls maternal mortality a "sentinel event", and uses it to assess the quality of a health care system. Maternal mortality data is said to be an important indicator of overall health system quality because pregnant women survive in sanitary, safe, well-staffed and stocked facilities. If new mothers are thriving, it indicates that the health care system is doing its job. If not, problems likely exist. According to Garret, increasing maternal survival, along with life expectancy, is an important goal for the world health community, as they show that other health issues are also improving. If these areas improve, disease-specific improvements are also better able to positively impact populations. "Maternal deaths are both caused by poverty and are a cause of it. The costs of childbirth can quickly exhaust a family's income, bringing with it even more financial hardship." In many developing countries, complications of pregnancy and childbirth are the leading causes of death among women of reproductive age. A woman dies from complications from childbirth approximately every minute. According to the World Health Organization, in its World Health Report 2005, poor maternal conditions account for the fourth leading cause of death for women worldwide, after HIV/AIDS, malaria, and tuberculosis. Most maternal deaths and injuries are caused by biological processes, not from disease, which can be prevented and have been largely eradicated in the developed world — such as postpartum hemorrhaging, which causes 34% of maternal deaths in the developing world but only 13% of maternal deaths in developed countries. Although high-quality, accessible health care has made maternal death a rare event in developed countries, where only 1% of maternal deaths occur, these complications can often be fatal in the developing world because single most important intervention for safe motherhood is to make sure that a trained provider with midwifery skills is present at every birth, that transport is available to referral services, and that quality emergency obstetric care is available. In 2008 342,900 women died while pregnant or from childbirth worldwide. Although a high number, this was a significant drop from 1980, when 526,300 women died from the same causes. This improvement was caused by lower pregnancy rates in some countries; higher income, which improves nutrition and access to health care; more education for women; and the increasing availability of "skilled birth attendants" — people with training in basic and emergency obstetric care — to help women give birth. The situation was especially led by improvements in large countries like India and China, which helped to drive down the overall death rates. In India, the government started paying for prenatal and delivery care to ensure access, and saw successes in reducing maternal mortality, so much so that India is cited as the major reason for the decreasing global rates of maternal mortality. Until the early 20th century developed and developing countries had similar rates of maternal mortality. Since most maternal deaths and injuries are preventable, they have been largely eradicated in the developed world. The U.S. has the "highest rate of maternal mortality in the industrialized world." It is also estimated that 50% of the deaths are from preventable causes. Since 2016, ProPublica and NPR investigated factors that led to the increase in maternal mortality in the United States. They reported that the "rate of life-threatening complications for new mothers in the U.S. has more than doubled in two decades due to pre-existing conditions, medical errors and unequal access to care." According to the Centers for Disease Control and Prevention, c. 4 million women who give birth in the US annually, over 50,000 a year, experience "dangerous and even life-threatening complications." Of those 700 to 900 die every year "related to pregnancy and childbirth." A "pervasive problem" is the rapidly increasing rate of "severe maternal morbidity" (SMM), which does not yet have a "single, comprehensive definition". According to a report by the United States Centers for Disease Control and Prevention, in 1993 the rate of Severe Maternal Morbidity, rose from 49.5 to 144 "per 10,000 delivery hospitalizations" in 2014, an increase of almost 200 percent. Blood transfusions also increased during the same period with "from 24.5 in 1993 to 122.3 in 2014 and are considered to be the major driver of the increase in SMM. After excluding blood transfusions, the rate of SMM increased by about 20% over time, from 28.6 in 1993 to 35.0 in 2014." The World Bank estimated that a total of 3.00 US dollars per person a year can provide basic family planning and both maternal and neonatal health care to women in developing countries. Many non-profit organizations have programs educating the public and gaining access to emergency obstetric care for mothers in developing countries. The United Nations Population Fund (UNPFA) recently began its Campaign on Accelerated Reduction of Maternal Mortality in Africa (CARMMA), focusing on providing quality healthcare to mothers. One of the programs within CARMMA is Sierra Leone providing free healthcare to mothers and children. This initiative has widespread support from African leaders and was started in conjunction with the African Union Health Ministers. Improving maternal health is the fifth of the United Nations' eight Millennium Development Goals (MDGs), targeting a reduction in the number of women dying during pregnancy and childbirth by three quarters by 2015, notably by increasing the usage of skilled birth attendants, contraception and family planning. The current decline of maternal deaths is only half of what is necessary to achieve this goal, and in several regions such as Sub-Saharan Africa the maternal mortality rate is actually increasing. However, one country that may meet their MDG 5 is Nepal, which has it appears reduced its maternal mortality by more than 50% since the early 1990s. As the 2015 deadline for the MDG's approaches, an understanding of the policy developments leading to the inclusion of maternal health within the MDG's is essential for future advocacy efforts. According to the UNFPA, maternal deaths would be reduced by about two-thirds, from 287,000 to 105,000, if needs for modern family planning and maternal and newborn health care were met. Therefore, investing in family planning and improved maternal health care brings many benefits including reduced risks of complications and improvement in health for mothers and their children. Education is also critical with research showing "that women with no education were nearly three times more likely to die during pregnancy and childbirth than women who had finished secondary school." Evidence shows that women who are better educated tend to have healthier children. Education would also improve employment opportunities for women which results in improving their status, contributing to family savings, reducing poverty and contributing to economic growth. All of these invests bring significant benefits and effects not only for women and girls but also their children, families, communities and their country. Developed countries had rates of maternal mortality similar to those of developing countries until the early 20th century, therefore several lessons can be learned from the west. During the 19th century Sweden had high levels of maternal mortality, and there was a strong support within the country to reduce mortality rate to fewer than 300 per 100,000 live births. The Swedish government began public health initiatives to train enough midwives to attend all births. This approach was also later used by Norway, Denmark, and the Netherlands who also experienced similar successes. Increasing contraceptive usage and family planning also improves maternal health through reduction in numbers of higher risk pregnancies and by lowering the inter-pregnancy interval. In Nepal a strong emphasis was placed on providing family planning to rural regions and it was shown to be effective. Madagascar saw a dramatic increase in contraceptive use after instituting a nationwide family planning program, the rate of contraceptive use increased from 5.1% in 1992 to 29% in 2008. ^ a b c d e f "Maternal health". www.unfpa.org. Retrieved 2018-04-22. ^ a b c d Kilpatrick SK, Ecker JL (September 2016). "Severe maternal morbidity: screening and review" (PDF). American Journal of Obstetrics and Gynecology. 215 (3): B17–22. doi:10.1016/j.ajog.2016.07.050. PMID 27560600. ^ a b Joint Commission 2010. ^ "Your postpartum checkups". Retrieved 2018-11-07. ^ a b c "The social determinants of maternal death and disability" (PDF). United Nations Population Fund. ^ Filippi V, Ronsmans C, Campbell OM, Graham WJ, Mills A, Borghi J, Koblinsky M, Osrin D (October 2006). "Maternal health in poor countries: the broader context and a call for action". Lancet. 368 (9546): 1535–41. doi:10.1016/S0140-6736(06)69384-7. PMID 17071287. ^ Timmermans S, Bonsel GJ, Steegers-Theunissen RP, Mackenbach JP, Steyerberg EW, Raat H, Verbrugh HA, Tiemeier HW, Hofman A, Birnie E, Looman CW, Jaddoe VW, Steegers EA (February 2011). "Individual accumulation of heterogeneous risks explains perinatal inequalities within deprived neighbourhoods". European Journal of Epidemiology. 26 (2): 165–80. doi:10.1007/s10654-010-9542-5. PMC 3043261. PMID 21203801. ^ Izugbara CO, Ngilangwa DP (December 2010). "Women, poverty and adverse maternal outcomes in Nairobi, Kenya". BMC Women's Health. 10 (33): 33. doi:10.1186/1472-6874-10-33. PMC 3014866. PMID 21122118. ^ a b Alexander G, Korenbrot CC (Spring 1995). "The Role of Prenatal Care in Preventing Low Birth Weight". The Future of Children. Low Birth Weight. 5 (1): 103–120. doi:10.2307/1602510. JSTOR 1602510. ^ a b Curry MA (1990). "Factors associated with inadequate prenatal care". Journal of Community Health Nursing. 7 (4): 245–52. doi:10.1207/s15327655jchn0704_7. JSTOR 3427223. PMID 2243268. ^ Gage AJ (October 2007). "Barriers to the utilization of maternal health care in rural Mali". Social Science & Medicine. 65 (8): 1666–82. doi:10.1016/j.socscimed.2007.06.001. PMID 17643685. ^ Materia E, Mehari W, Mele A, Rosmini F, Stazi MA, Damen HM, Basile G, Miuccio G, Ferrigno L, Miozzo A (September 1993). "A community survey on maternal and child health services utilization in rural Ethiopia". European Journal of Epidemiology. 9 (5): 511–6. doi:10.1007/bf00209529. JSTOR 3520948. PMID 8307136. ^ a b McIntyre J (May 2005). "Maternal health and HIV". Reproductive Health Matters. 13 (25): 129–35. doi:10.1016/s0968-8080(05)25184-4. JSTOR 3776238. PMID 16035606. ^ The state of the world's children 2013. Geneva: UNICEF. 2013. ^ Toure K, Sankore R, Kuruvilla S, Scolaro E, Bustreo F, Osotimehin B (February 2012). "Positioning women's and children's health in African union policy-making: a policy analysis". Globalization and Health. 8: 3. doi:10.1186/1744-8603-8-3. PMC 3298467. PMID 22340362. ^ "Preventing Mother-to-Child Transmission of HIV". HIV.gov. 2017-05-15. Retrieved 2018-11-07. ^ "Weight Gain During Pregnancy | Pregnancy | Maternal and Infant Health | CDC". www.cdc.gov. 2019-01-17. Retrieved 2019-03-28. ^ Nodine PM, Hastings-Tolsma M (2012). "Maternal obesity: improving pregnancy outcomes". McN. The American Journal of Maternal Child Nursing. 37 (2): 110–5. doi:10.1097/nmc.0b013e3182430296. PMID 22357072. , cited in Santrock JW (2013). Life-Span Development (14th ed.). McGraw Hill. ^ Chu SY, Callaghan WM, Kim SY, Schmid CH, Lau J, England LJ, Dietz PM (August 2007). "Maternal obesity and risk of gestational diabetes mellitus". Diabetes Care. 30 (8): 2070–6. doi:10.2337/dc06-2559a. PMID 17416786. ^ Glazer NL, Hendrickson AF, Schellenbaum GD, Mueller BA (November 2004). "Weight change and the risk of gestational diabetes in obese women". Epidemiology. 15 (6): 733–7. doi:10.1097/01.ede.0000142151.16880.03. JSTOR 20485982. PMID 15475723. ^ "Keep Active and Eat Healthy to Improve Well-being and Feel Great | NIDDK". National Institute of Diabetes and Digestive and Kidney Diseases. Retrieved 2019-03-28. ^ a b c d e National Institute of Dental and Craniofacial Research (2000). Oral Health in America: A Report of the Surgeon General. Rockville, Maryland: U.S. Department of Health and Human Services. ^ a b c d "Oral Health During Pregnancy and Childhood: Evidence-based Guidelines for Health Professionals" (PDF). California Dental Association. 2010. Archived from the original (PDF) on 2010-05-25. ^ "Partnership between private practice providers and hospitals enhances access to comprehensive dental care for underserved, low-income pregnant women". Agency for Healthcare Research and Quality. 2013-02-27. Retrieved 2013-05-13. ^ a b c d Oral Health Care During Pregnancy Expert Workgroup (2012). "Oral health care during pregnancy: a national consensus statement—summary of an expert workgroup meeting" (PDF). Washington, DC: National Maternal and Child Oral Health Resource Center. ^ a b c d Boggess KA, Edelstein BL (September 2006). "Oral health in women during preconception and pregnancy: implications for birth outcomes and infant oral health". Maternal and Child Health Journal. 10 (5 Suppl): S169–74. doi:10.1007/s10995-006-0095-x. PMC 1592159. PMID 16816998. ^ Boggess KA, Beck JD, Murtha AP, Moss K, Offenbacher S (May 2006). "Maternal periodontal disease in early pregnancy and risk for a small-for-gestational-age infant". American Journal of Obstetrics and Gynecology. 194 (5): 1316–22. doi:10.1016/j.ajog.2005.11.059. PMID 16647916. ^ Boggess KA (April 2008). "Maternal oral health in pregnancy". Obstetrics and Gynecology. 111 (4): 976–86. doi:10.1097/AOG.0b013e31816a49d3. PMID 18378759. ^ "Prenatal care and tests | womenshealth.gov". womenshealth.gov. 2016-12-13. Retrieved 2018-11-07. ^ Hurt H, Brodsky NL, Roth H, Malmud E, Giannetta JM (2005). "School performance of children with gestational cocaine exposure". Neurotoxicology and Teratology. 27 (2): 203–11. doi:10.1016/j.ntt.2004.10.006. PMID 15734271. ^ a b c d e f g Santrock JW (2013). Life-Span Development (14th edition). New York, NY: McGraw Hill. pp. 82–83. ISBN 978-0-07-131868-6. ^ Crijns HJ, van Rein N, Gispen-de Wied CC, Straus SM, de Jong-van den Berg LT (October 2012). "Prescriptive contraceptive use among isotretinoin users in the Netherlands in comparison with non-users: a drug utilisation study" (PDF). Pharmacoepidemiology and Drug Safety. 21 (10): 1060–6. doi:10.1002/pds.3200. PMID 22228673. ^ Koren G, Nordeng H (September 2012). "Antidepressant use during pregnancy: the benefit-risk ratio". American Journal of Obstetrics and Gynecology. 207 (3): 157–63. doi:10.1016/j.ajog.2012.02.009. PMID 22425404. ^ Bennett SA, Bagot CN, Arya R (June 2012). "Pregnancy loss and thrombophilia: the elusive link". British Journal of Haematology. 157 (5): 529–42. doi:10.1111/j.1365-2141.2012.09112.x. PMID 22449204. ^ Marret S, Marchand L, Kaminski M, Larroque B, Arnaud C, Truffert P, Thirez G, Fresson J, Rozé JC, Ancel PY (January 2010). "Prenatal low-dose aspirin and neurobehavioral outcomes of children born very preterm". Pediatrics. 125 (1): e29–34. doi:10.1542/peds.2009-0994. PMID 20026499. ^ Blandthorn J, Forster DA, Love V (March 2011). "Neonatal and maternal outcomes following maternal use of buprenorphine or methadone during pregnancy: findings of a retrospective audit". Women and Birth. 24 (1): 32–9. doi:10.1016/j.wombi.2010.07.001. PMID 20864426. ^ Field TM (2007). The amazing infant. Malden, MA: Blackwell. ^ Meyer KD, Zhang L (February 2009). "Short- and long-term adverse effects of cocaine abuse during pregnancy on the heart development". Therapeutic Advances in Cardiovascular Disease. 3 (1): 7–16. doi:10.1177/1753944708099877. PMC 2710813. PMID 19144667. ^ Richardson GA, Goldschmidt L, Leech S, Willford J (2011). "Prenatal cocaine exposure: Effects on mother- and teacher-rated behavior problems and growth in school-age children". Neurotoxicology and Teratology. 33 (1): 69–77. doi:10.1016/j.ntt.2010.06.003. PMC 3026056. PMID 20600846. ^ Piper BJ, Acevedo SF, Kolchugina GK, Butler RW, Corbett SM, Honeycutt EB, Craytor MJ, Raber J (May 2011). "Abnormalities in parentally rated executive function in methamphetamine/polysubstance exposed children". Pharmacology Biochemistry and Behavior. 98 (3): 432–9. doi:10.1016/j.pbb.2011.02.013. PMC 3069661. PMID 21334365. ^ Goldschmidt L, Richardson GA, Willford J, Day NL (March 2008). "Prenatal marijuana exposure and intelligence test performance at age 6". Journal of the American Academy of Child and Adolescent Psychiatry. 47 (3): 254–63. doi:10.1097/chi.0b013e318160b3f0. PMID 18216735. ^ Abbott LC, Winzer-Serhan UH (April 2012). "Smoking during pregnancy: lessons learned from epidemiological studies and experimental studies using animal models". Critical Reviews in Toxicology. 42 (4): 279–303. doi:10.3109/10408444.2012.658506. PMID 22394313. ^ Antonopoulos CN, Sergentanis TN, Papadopoulou C, Andrie E, Dessypris N, Panagopoulou P, Polychronopoulou S, Pourtsidis A, Athanasiadou-Piperopoulou F, Kalmanti M, Sidi V, Moschovi M, Petridou ET (December 2011). "Maternal smoking during pregnancy and childhood lymphoma: a meta-analysis". International Journal of Cancer. 129 (11): 2694–703. doi:10.1002/ijc.25929. PMID 21225624. ^ Cheng D, Kettinger L, Uduhiri K, Hurt L (February 2011). "Alcohol consumption during pregnancy: prevalence and provider assessment". Obstetrics and Gynecology. 117 (2 Pt 1): 212–7. doi:10.1097/aog.0b013e3182078569. PMID 21252732. ^ Paintner A, Williams AD, Burd L (February 2012). "Fetal alcohol spectrum disorders-- implications for child neurology, part 1: prenatal exposure and dosimetry". Journal of Child Neurology. 27 (2): 258–63. doi:10.1177/0883073811428376. PMID 22351188. ^ Paintner A, Williams AD, Burd L (March 2012). "Fetal alcohol spectrum disorders--implications for child neurology, part 2: diagnosis and management". Journal of Child Neurology. 27 (3): 355–62. doi:10.1177/0883073811428377. PMID 22241713. ^ Pettitt DJ, Baird HR, Aleck KA, Bennett PH, Knowler WC (February 1983). "Excessive obesity in offspring of Pima Indian women with diabetes during pregnancy". The New England Journal of Medicine. 308 (5): 242–5. doi:10.1056/NEJM198302033080502. PMID 6848933. ^ Dabelea D, Hanson RL, Bennett PH, Roumain J, Knowler WC, Pettitt DJ (August 1998). "Increasing prevalence of Type II diabetes in American Indian children". Diabetologia. 41 (8): 904–10. doi:10.1007/s001250051006. PMID 9726592. ^ Li JM, Chen YR, Li XT, Xu WC (February 2011). "Screening of Herpes simplex virus 2 infection among pregnant women in southern China". The Journal of Dermatology. 38 (2): 120–4. doi:10.1111/j.1346-8138.2010.00966.x. PMID 21269306. ^ Nigro G, Mazzocco M, Mattia E, Di Renzo GC, Carta G, Anceschi MM (August 2011). "Role of the infections in recurrent spontaneous abortion". The Journal of Maternal-fetal & Neonatal Medicine : The Official Journal of the European Association of Perinatal Medicine, the Federation of Asia and Oceania Perinatal Societies, the International Society of Perinatal Obstetricians. 24 (8): 983–9. doi:10.3109/14767058.2010.547963. PMID 21261443. ^ a b c McIntyre J, Gray G (January 2002). "What can we do to reduce mother to child transmission of HIV?". BMJ. 324 (7331): 218–21. doi:10.1136/bmj.324.7331.218. JSTOR 25227275. PMC 1122134. PMID 11809646. ^ a b "Medicines for Maternal Health". UNFPA. ^ a b Hollander D (September 2000). "Most Infant HIV Infection from Breast Milk Occurs within Six Weeks of Birth". International Family Planning Perspectives. 26 (3): 141. doi:10.2307/2648305. JSTOR 2648305. ^ a b c Stuebe AM, Schwarz EB (March 2010). "The risks and benefits of infant feeding practices for women and their children". Journal of Perinatology. 30 (3): 155–62. doi:10.1038/jp.2009.107. PMID 19609306. ^ "Maternal deaths worldwide drop by third". World Health Organization. 15 September 2010. ^ African Progress Panel (2010). "Maternal Health: Investing in the Lifeline of Healthy Societies & Economies" (PDF). Africa Progress Panel. ^ NATIONAL PARTNERSHIP FOR WOMEN & FAMILIES (April 2018). "Black Maternal Health Disparities" (PDF). Snapshot. ^ "Evaluation Findings: Support to traditional birth attendants" (PDF). United Nations Population Fund. 1996. 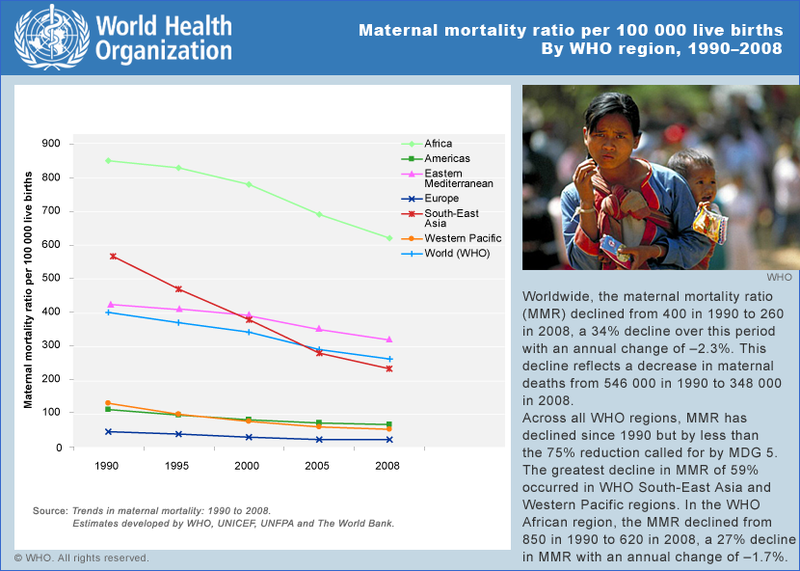 ^ "Maternal mortality ratio per 100,000 live births by WHO region, 1990–2008". World Health Organization. ^ "Obstetric Care Consensus No 5 Summary: Severe Maternal Morbidity: Screening And Review" (PDF). Obstetrics and Gynecology. 128 (3): 670–1. September 2016. doi:10.1097/AOG.0000000000001635. PMID 27548549. Retrieved December 22, 2017. ^ World Health Organization (2005). "World Health Report 2005: make every mother and child count". Geneva: WHO. ^ "Most Maternal Deaths in Sub-Saharan Africa Could Be Avoided". Science Daily. 2 March 2010. ^ "Maternal Health Task Force". Maternal Health Talk Force. Archived from the original on 2011-03-11. ^ a b Grady D (13 April 2010). "Maternal Deaths Decline Sharply Across the Globe". New York Times. ^ a b De Brouwere V, Tonglet R, Van Lerberghe W (October 1998). "Strategies for reducing maternal mortality in developing countries: what can we learn from the history of the industrialized West?". Tropical Medicine & International Health. 3 (10): 771–82. doi:10.1046/j.1365-3156.1998.00310.x. PMID 9809910. ^ a b c Ellison K, Martin N (December 22, 2017). "Severe Complications for Women During Childbirth Are Skyrocketing — and Could Often Be Prevented". Lost mothers. ProPublica. Retrieved December 22, 2017. ^ Troiano, Nan H.; Witcher, Patricia M. (2018). "Maternal Mortality and Morbidity in the United States". The Journal of Perinatal & Neonatal Nursing. 32 (3): 222–231. doi:10.1097/jpn.0000000000000349. ISSN 0893-2190. PMID 30036304. ^ "Severe Maternal Morbidity in the United States". Atlanta, Georgia. Centers for Disease Control and Prevention. November 27, 2017. Retrieved December 21, 2017. Division of Reproductive Health, National Center for Chronic Disease Prevention and Health Promotion, U.S. Department of Health & Human Services. ^ United Nations: "Investing in the health of Africa's mothers"
^ Rosenfield et al 2006. ^ Boese K, Dogra N, Hosseinpour S, Kobylianskii A, Vakeesan V (2013). "Chapter 1 – Analyzing the Inclusion of MDG 5, Improving Maternal Health, among the UN's Millennium Development Goals." (PDF). In Hoffman SJ, Ali M (eds.). Student Voices 6: Political Analyses of Five Global Health Decisions. Hamilton, Canada: McMaster Health Forum. ^ Wendt A, Gibbs CM, Peters S, Hogue CJ (July 2012). "Impact of increasing inter-pregnancy interval on maternal and infant health". Paediatric and Perinatal Epidemiology. 26 Suppl 1: 239–58. doi:10.1111/j.1365-3016.2012.01285.x. PMC 4562277. PMID 22742614. ^ Ganatra B, Faundes A (October 2016). "Role of birth spacing, family planning services, safe abortion services and post-abortion care in reducing maternal mortality". Best Practice & Research. Clinical Obstetrics & Gynaecology. 36: 145–155. doi:10.1016/j.bpobgyn.2016.07.008. PMID 27640082. ^ Report of a technical consultation on birth spacing (PDF) (Report). WHO. 2005. Retrieved 2018-04-03. ^ World Health Organization and UNICEF (2010). "Countdown to 2015 decade report (2000–2010): taking stock of maternal, newborn and child survival" (PDF). Geneva: WHO and UNICEF. Joint Commission (26 January 2010). "Preventing maternal death" (PDF). Sentinel Event Alert (44). "Maternal survival (5 articles)". The Lancet. 368. September–October 2006. Rosenfield A, Maine D, Freedman L (September 2006). "Meeting MDG-5: an impossible dream?". Lancet. 368 (9542): 1133–5. doi:10.1016/S0140-6736(06)69386-0. PMID 17011925. UN (2015). The Millennium Development Goals Report 2015 (PDF). New York: United Nations. "5. Improve maternal health". Millennium Development Goals. UNICEF. "Maternal Health". World Health Organization.